Giant Hogweed (Heracleum mantegazzianum) is a perennial plant and a member of the carrot family. It is a garden ornamental from southwest Asia that is naturalizing in North America and becoming more common in southern and central Ontario. 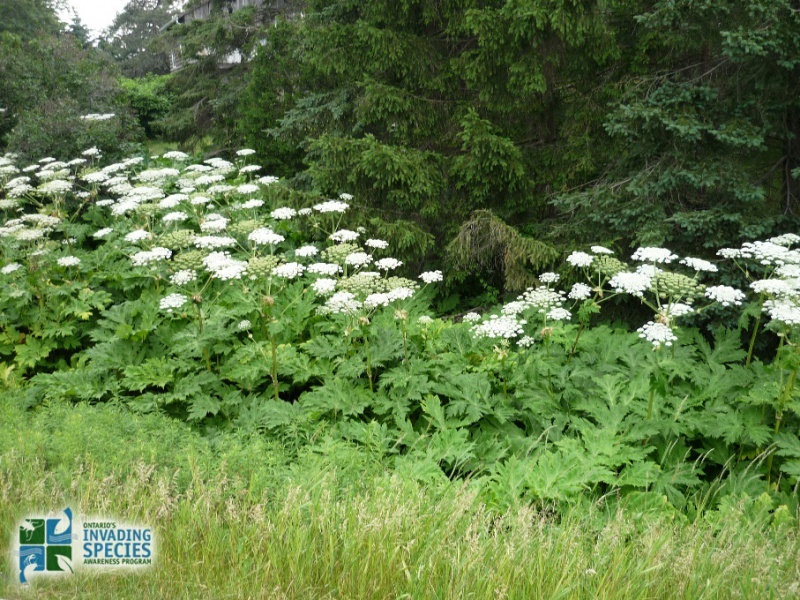 Giant Hogweed has the potential to spread readily and grows along roadsides, ditches and streams. It invades old fields and native habitats such as open woodlands. There are a number of plants that look very similar to Giant hog﻿weed such as Cow parsnip, Purplestem angelica, Woodland angelica, Valerian, Lovage, and Queen Anne’s-Lace (also known as Wild carrot). However, these plants are not as large as a mature Giant hogweed, which grows up to 5.5 metres tall under ideal conditions. The white flower clusters resemble those of Queen Anne’s-Lace, but tend to be more widely spaced and can form a flower-head almost one metre wide. Check out the Giant Hogweed and Look-a-Likes resource to see the differences. Giant hogweed has a scattered distribution across southern and central Ontario, south of the line from Manitoulin Island to Ottawa. 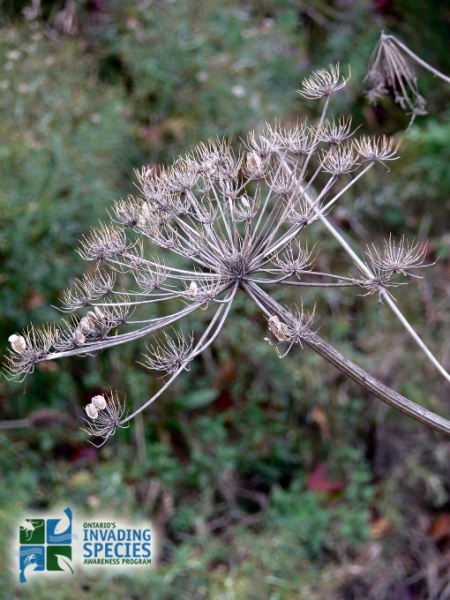 Click here for the Early Detection & Distribution Mapping System (EDDMapS) to view and contribute to Giant Hogweed sightings in Ontario. Seeds may take several years to germinate and are viable in the soil for up to 15 years. During the first year, the plant produces a rosette of leaves up to one metre high. After 2 to 5 years the plant produces flowers. As it grows a large root, thick hollow stems and large lobed leaves are formed. The stems of the plant are covered with reddish-purple flecks and stiff hairs filled with sap. Sap may also collect in the hollow stem bases. Giant hogweed flowers once in its lifetime, unless the flower clusters are damaged before opening. Once the plant produces seeds it dies. Each plant can produce up to 120,000 winged seeds (typically 50,000). Seeds dropped in streams can float for three days. They can move long distances via water in ditches and streams. Seeds can also be spread up to 10 metres by the wind. 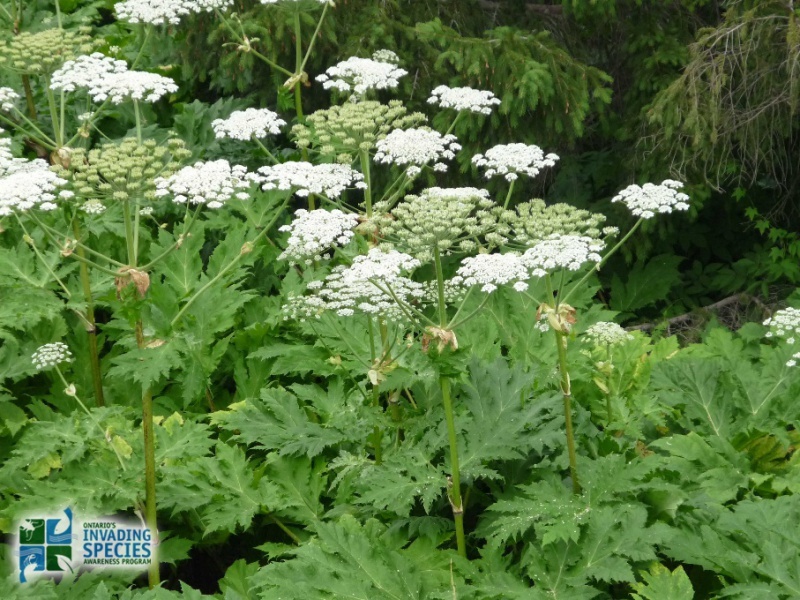 There is evidence that Giant hogweed can shade out native plants, although scientists have not done extensive research on its impact in Ontario or Canada. In the United Kingdom it grows in areas bordering lakes, streams, and wetlands and causes rocks, soil and other material on stream banks to fall into streams. This threatens salmon spawning sites. Similar impacts may occur in Ontario. The clear watery sap of Giant hogweed contains toxins that can cause severe dermatitis (inflammation of the skin). You can get severe burns if you get the sap on your skin and the skin is then exposed to sunlight. Symptoms occur within 48 hours and consist of painful blisters. Purplish scars may form that last for many years. Eye contact with the sap has been reported (in the media and by various web sites) to cause temporary or permanent blindness. However, evidence of permanent blindness linked to exposure to Giant hogweed cannot be substantiated by any existing research. Coming in contact with Cow parsnip and Wild parsnip can cause similar reactions. Do not purchase, trade or grow Giant hogweed in your garden. Only buy native or non-invasive garden plants. When you transport soil, sand or gravel make sure it is free of Giant hogweed – both plant parts and seeds. 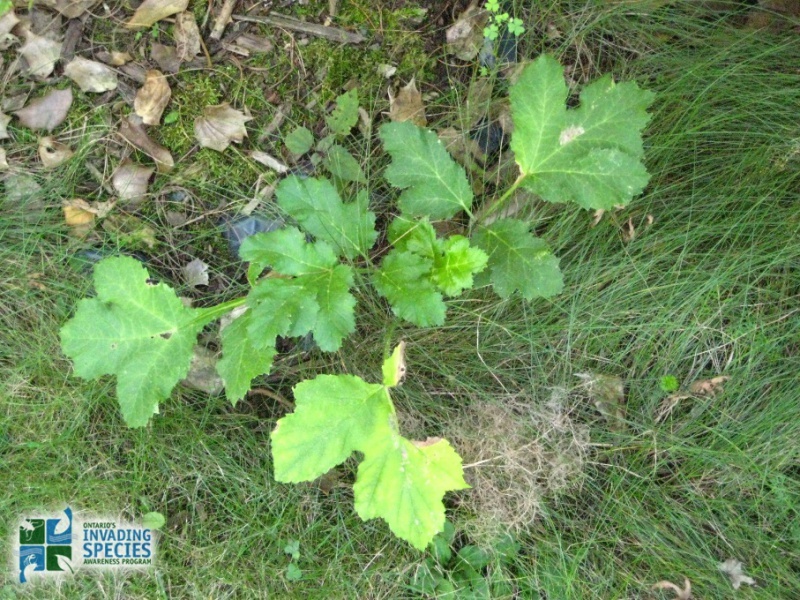 If you have Giant hogweed on your property, it is recommended that you hire a professional exterminator to remove it. The plant will be removed safely and as few seeds as possible will be spread. Reducing a large population of Giant hogweed will take a long term commitment. The best time to remove the plant is in late April or early May. It is usually less than 30 centimetres tall, easier to dig up, and more susceptible to herbicides at this time of year. It is also cooler in the spring than in the summer so wearing protective clothing is more comfortable. Protective clothing: Wear protective clothing, including waterproof gloves, long sleeve shirts, pants, and eye protection. It is ideal to wear a disposable “spray suit” coverall over top of your normal clothing (spray suits are commercial grade waterproof coveralls). Remove protective clothing carefully to avoid transferring any sap from your clothing onto your skin. Wash your rubber gloves with soap and water, and then take off your spray suit or outer clothing. Wash your rubber gloves again and then take them off. Finally, take off your protective eye wear. Put non-disposable clothing in the laundry and wash yourself immediately with soap and water. Use a spade to remove as much of the root as possible. Digging up older plants can be difficult since roots can grow deeper than one metre. The plant might re-grow from the root and you may need to dig repeatedly to remove it completely. Or, you can cover the dug area with black plastic to smother out new growth. If it’s possible to use machinery, mow new growth every two weeks. Plants without flowers: If the infestation is small dig the stems and roots out and dry them thoroughly before disposing of them. Plants with flowers: To prevent seeds from growing and spreading, remove flower heads before they ripen (when they are white). Note: If the flower heads have changed from white to green, seeds are being produced and it will be very hard to remove the seed heads and/or cut the plant without spreading the seeds. Return to the area regularly and remove any new growth. Herbicides can be used to control plants (like Giant hogweed) that are poisonous to the touch. Glyphosate is effective at controlling the top-growth of Giant hogweed. Foliar herbicide applications are most effective in spring on actively growing plants, followed with a subsequent summer application for missed plants or plants that have regrown. Since glyphosate is non-selective and removes only the green vegetation that it comes into contact with, new seedlings will often germinate and emerge after glyphosate has been applied. If areas treated with glyphosate are covered in mulch 10 to 14 days after application, it will reduce seedling germination and growth. Herbicide treatments may need to be repeated in following years. If a plant is flowering, herbicides are not effective and control methods should focus on carefully removing the flower heads. Follow label directions and relevant provincial and federal legislation when using herbicides. Do Not Burn. Do Not Compost. Carefully remove flower heads from stems and place them in black plastic bags. Make sure not to drop any seeds while you are doing this. Seal the bags tightly and leave them in direct sunlight for about a week. Allow stems and roots to dry out thoroughly before disposing of them. 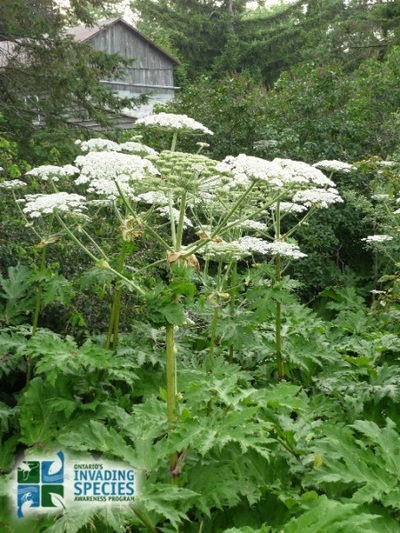 Call your municipality to find out if bags containing Giant hogweed can be sent to your local municipal landfill site. In the event of any direct exposure/contact to this plant; If you get sap on your skin wash the area well with soap and water. Keep the affected area out of the sun. If photo dermatitis (inflammation of the skin caused by exposure to sunlight) occurs, see a doctor. If you get sap in your eye, flush your eye with water immediately and see a doctor immediately. 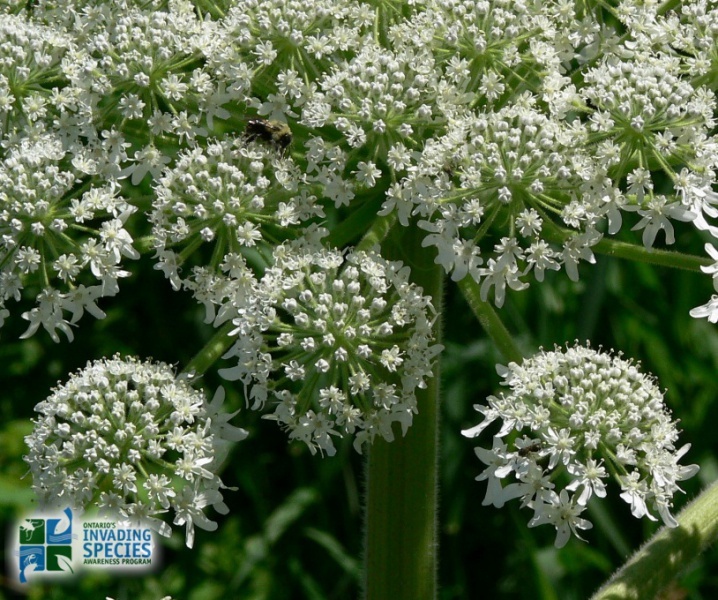 If you think you have Giant hogweed on your property or if you see it in your community please call the Invading Species Hotline at 1-800-563-7711 or report your sighting online. You will be asked to send in photos for identification. Do not collect parts of the plant for identification. 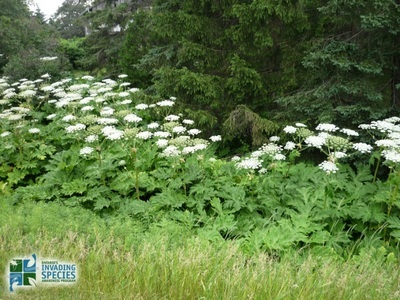 The Ontario Ministries of Agriculture, Food and Rural Affairs, Health and Long Term Care, Environment, and Natural Resources are working together with our partners (in particular Ontario Federation of Anglers and Hunters, Ontario Invasive Plant Council, Municipalities and Conservation Authorities) to provide information on the identification and control of Giant hogweed. OFAH/OMNR Invading Species Awareness Program. (2012). Giant Hogweed. Retrieved from:http://www.invadingspecies.com. This factsheet may be reproduced for non-commercial purposes.